When it comes to our pets, sometimes we think that since their wild counterparts give birth all alone in their natural habitats, they must just instinctively know what they are doing and not experience any problems at all. However, our cats do need our support while they are pregnant and sometimes they do need our assistance delivering live, healthy kittens. This posting will involve two parts. Here we will outline some key aspects of monitoring the pregnancy itself and later we will consider the actual labor and delivery. First of all, let’s remember that our cats are not wild cats. Even though your cat may still have some of the same survival instincts as a wild cat, she is no longer physically a wild cat. Firstly, she may not be in that peak physical condition that would allow her to successfully chase down a racing impala to procure a meal. Let’s face it, her bowl of kibble doesn’t move that fast! Secondly, if she is a pure bred cat, she may be more prone to dystocia (or difficult birth). According to Veterinary Record and a survey reported by DA Gunn-Moore and MV Thrusfield, dystocia occurred in only 0.4% of litter in a colony of mixed breed cats compared to 18.2% of litter of Devon Rex cats. Breeds with disproportionately large heads had a higher incidence of dystocia than those without. Thus, if you have a purebred cat, be sure to do your research. 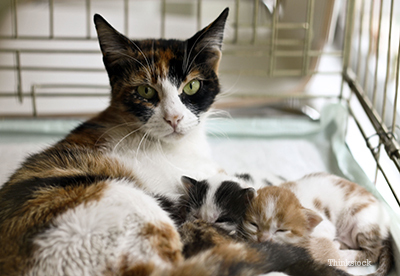 Try to know your cat’s due date so you'll have some idea if she becomes overdue. An average gestation period is about 63 days, but sometimes accidents happen and you just don’t have any idea breeding occurred. If, however, you are working with your veterinarian from the beginning (and you should be), then hormone tests that time ovulation and/or vaginal cytology that identify stages of the heat cycle can be performed to give you a much more reliable due date to plan around. As the predicted due date draws near it’s also helpful to take your cat’s rectal temperature at the same time every day since labor typically starts within a day of a temperature drop to below 99 degrees. How many kittens are coming? If her expanding abdomen is making it harder for her to eat big meals, feed her more small ones. Consider switching to a calorie-rich cat food since her energy needs will rise steadily and by late pregnancy she will likely be eating about 60% more than before1. Note, however, that a transient anorexia may very rarely occur in pregnant cats during early or very late pregnancy. In these cases, normal appetite usually returns within a few days1. Nevertheless, call your veterinarian if your pregnant cat show signs of nausea or stops eating. Pay attention to any signs that indicate she's having difficulty getting comfortable and offer her choices in where to rest/sleep: someplace softer, someplace cooler, even someplace on a slant. And if your cat cannot get comfortable or seems anxious or distressed, contact your veterinarian. Cats are fastidious groomers so you may not ever see any vaginal discharge. If you do, though, it should be clear or white mucus. If you see anything else, call your veterinarian. If anything concerns you at all, contact your veterinarian. Clearly, communicating with your veterinarian throughout the process is essential. Remember your cat is not a wild cat alone in the world. She has an advocate to watch out for her - YOU.